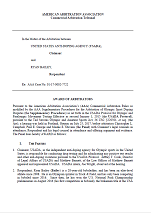 USADA announced today that a three-member panel of the American Arbitration Association (AAA) has rendered an operative award in the case of bobsled athlete, Ryan Bailey, of Sherwood, Ore., and has determined that Bailey should receive a six-month sanction after testing positive for a prohibited substance. The AAA panel will issue a reasoned award within 30 days. 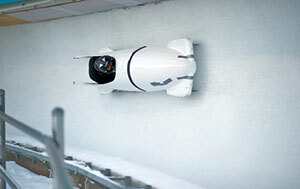 Bailey, 28, tested positive for 1,3-dimethylbutylamine (DMBA) as the result of an in-competition urine sample he provided on January 10, 2017, at the International Bobsleigh and Skeleton Federation (IBSF) North American Cup. DMBA is a Specified Substance in the class of Stimulants and prohibited in-competition under the USADA Protocol for Olympic and Paralympic Movement Testing, the United States Olympic Committee National Anti-Doping Policies, and the IBSF Anti-Doping Rules, all of which have adopted the World Anti-Doping Code (the Code) and the World Anti-Doping Agency (WADA) Prohibited List. The AAA Panel accepted Bailey’s explanation that his positive test was caused by his use of a high risk dietary supplement. Detailed analysis conducted on the supplement by the WADA-accredited laboratory in Salt Lake City, Utah, confirmed that the supplement contained DMBA. Although DMBA was not listed on the Supplement Facts label, another closely related prohibited stimulant, methylhexaneamine, also known as 1,3-Dimethylamylamine (DMAA), was listed on the label. USADA and the FDA have issued past warnings and education specifically about DMAA and DMBA, and other prohibited stimulants, in dietary supplements, highlighting the dangers of a positive anti-doping test and/or adverse health event. The current version of the supplement that caused Bailey’s positive test, which lists DMAA as an ingredient, but in fact contains DMBA, was added in April 2017 to the USADA High Risk List of supplements maintained on USADA’s online dietary supplement safety education and awareness resource, Supplement 411. Athletes and other sport stakeholders are reminded that, unlike medications, dietary supplements sold in the U.S. do not receive any pre-market safety or efficacy reviews by government authorities. Thus, an increased level of due diligence is necessary to challenge the reasons for use and understand the risks of a positive anti-doping test and/or an adverse health event. Bailey’s six-month period of ineligibility began on January 10, 2017, the date his positive sample was collected. In addition, Bailey has been disqualified from all competitive results obtained on and subsequent to January 10, 2017, including forfeiture of any medals, points and prizes. As such, all of Bailey’s results at the IBSF North American Cup have been disqualified, including his first place result from January 10, 2017, in the 2-man bobsled event, and his sixth place result from January 12, 2017, in the 4-man bobsled event. This award, as well as other arbitral decisions, can be found here.